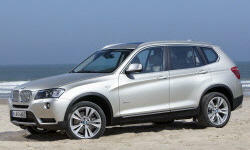 2013 BMW X3 Pros and Cons: Why (Not) This Car? What if you could have the high seating position of an SUV without having to pay for it with the handling, ride quality, and mpg of a truck? Physics says no. Car makers are giving it their best shot anyway because they know it's what you want, and because they care. This year, BMW takes another step towards this holy grail by replacing the X3 xDrive28i's 3.0-liter inline six-cylinder engine with a 2.0-liter four turbocharged to yield the same 240 peak horsepower. How close have they come? Severe black IP at odds with light-colored wood trim and seats. Why the 2013 BMW X3? In no crossover will you forget you're in a taller, heavier machine. But the X3 does out-handle its closest competitors, the Audi Q5, Mercedes GLK, and Volvo XC60. Equipped with the Dynamic Handling Package (DHP), the BMW feels tighter in casual driving. It opens up a larger advantage when hustled, delivering the balance, composure, and precise control for which BMWs are known, with just a tad of rear end sway in hard turns. Up to a fairly high point, the harder you push the X3 the better it feels. The DHP includes torque vectoring, which works the brakes to rotate the car more quickly. Due to this feature or the inherent dynamics of the chassis, the all-wheel-drive X3 can get tail-happy, especially on slick roads. The stability control promptly intervenes. Skilled drivers ISO more fun can dial back this system via a convenient button. Control remains easy if you know how to countersteer. Selecting the Sport+ driving mode similarly retards the stability control while taking the steering, suspension, throttle, and transmission up a notch or two. Sport mode lets you choose whether to step up the drivetrain, chassis, or both. Not all approaches perfection. Assisted by an electric motor, the DHP's variable ratio steering weights up nicely when turned yet feels artificial. I felt very much in control of the X3, and enjoyed driving it, but we didn't quite meld. I love the sound and feel of a finely tuned, normally-aspirated inline six-cylinder engine as much as anyone. But I've got to grant that the new turbocharged four outperforms the engine it replaced. Peak horsepower is the same, 240, but it arrives 1,600 rpm sooner, at a much more accessible 5,000 rpm. Through the midrange, where engines spend most of their time in typical suburban driving, the four is much stronger, as indicated by its peak torque (260 vs. 221 pound-feet). Boost lag is usually undetectable. The X3 xDrive35i's turbocharged six (300 hp, 300 lb-ft) can get to 60 mph about a second quicker (official times are 5.5 vs. 6.6), but doesn't feel much stronger in daily driving. The primary advantage of the six over the four remains sound and feel. At idle the four vibrates and sounds somewhat like a diesel engine. It sounds better and feels smoother when revved, and happily visits the red line, but it can't sing like a six. Either engine is paired with a mandatory eight-speed automatic that has a ratio for any situation and readily provides it. While most shifts are smooth, the transmission sometimes bumps into lower gears as you slow to a stop. In Sport mode, the transmission reacts more quickly, shifts more firmly, and holds a lower gear when not accelerating. But due to the last it can't be used all the time without doing serious harm to fuel economy. Kinked rear side window a BMW thing. All-black IP is all business. Electronic shifter requires on-screen instructions--a sign? Thanks partly to power-adjustable side bolsters, the X3's optional sport seats are both supportive and comfortable. They're firm where you want them to be firm, yet (unlike those in the Audi and Mercedes-Benz) cushy where you want them to be cushy. The Volvo XC60's seats are also very comfortable, but can't quite match the BMW's lateral support. You sit substantially higher than in a BMW sedan, both relative to the ground and to the instrument panel. The windshield is more distant than in the original X3, making the current one seem considerably larger, but it remains more upright than in most recently designed crossovers. The forward visibility many people buy a crossover to get can be gotten here. Rear seat legroom increased by an inch with the 2011 redesign, and is now competitive. A couple of adults will fit, so there's no compelling functional reason to step up to the X5 unless you require tall people to be comfortable back there. While the boosted four has a clear performance advantage, the swap was motivated primarily by the push for better fuel economy. EPA ratings are 21 mpg city, 28 highway, vs. the 2012 six's 19/25. An Audi Q5 comes close, 20/28, but with 211 horsepower isn't as strong. Despite weighing about 400 pounds less than the X3's 4,112, a Ford Escape with a similarly spec'd engine does no better. A Mercedes GLK350? 19/24. The Volvo is even worse. Compared to cars, the X3 doesn't fare as well. The roomier, nearly as heavy 528i rates 22/33. The crossover's larger frontal area and higher ground clearance take their toll as speed climbs. In our real-world sub-freezing suburban driving, the trip computer usually reported about 21 once the engine was warmed up, matching the EPA rating and quite good for a powerful, two-ton, all-wheel-drive vehicle. Engage an aggressive Eco Pro mode for a Prius-like throttle response and ultra-low rpm shifts, and mid-20s are easily achievable while high 20s are possible. I even observed 32 over one short trip where the lights were in my favor. But the cars behind you won't be happy. Conversely, enjoy the turbo at every opportunity and fuel economy will fall into the teens. A defeatable standard auto start/stop system operates a little more smoothly than in last year's 3-Series, but not as smoothly as it ought to. The original X3 seemed cheap inside. The 2013's interior is much nicer, with the materials and sense of solidity people expect in a $40,000+ compact crossover. Even compared to the dramatically upgraded 2013 Ford Escape the X3 retains enough of an edge in perceived build quality to justify its $10,000 premium. Some exceptions remain, though. The black plastic around the audio controls looks very basic and creaks when pressed with a fingertip. Why Not the 2013 BMW X3? There's an obvious reason every compact crossover buyer doesn't buy a BMW. The BMW X3 xDrive28i starts at $39,395, but options can push the price over $50,000. The tested car, with most but not all options, listed for $52,345. A Mercedes-Benz GLK350 is about $1,200 more, but includes a six-cylinder engine. Compared to an Audi Q5 2.0T, the X3 lists for about $3,000 more, not a trivial sum. BMW clearly recognizes that many buyers will care more about luxury than performance and handling. They've delivered the requisite build quality and refinement, and noise levels are low enough for a luxury role, if not the lowest. Interior ambiance could be an issue--we'll get to this. The biggest question mark, though, concerns ride quality. The original BMW X3 was heavily criticized for its harsh ride. A mid-cycle refresh helped, and the 2011 redesign helped even more. Still, while the X3's ride is no longer harsh, on some roads it can become irritatingly busy, especially if you're just trying to relax. This is with the standard 18-inch touring tires (Goodyear Eagle LS on the tested car). With the optional, lower profile performance tires the ride should be worse (though handling and exterior appearance should benefit). With the DHP's adaptive dampers, switching to Comfort mode helps, but the difference isn't night-and-day. Before buying an X3, test drive it long enough to relax on the roads you normally travel. Double kidney grille and quad angle-eye headlamps clearly BMW. About average for the segment. Adults will fit. Since you can add $15,000 in options, the BMW X3 is clearly available with a large number of features. Some, like the power adjustable side bolsters, aren't available in competitors. But competitors have some features not available in the North American X3. We can't get adaptive cruise control, blind sport warning, lane departure prevention, or a drowsiness monitor. If you put a high priority on the latest safety-related tech, you might prefer a Mercedes-Benz GLK350. Then again, many driving enthusiasts prefer not to have these features. The BMW X3 isn't an ugly car, but it also isn't a stylish one. For the most part, BMW has taken a basic compact crossover shape and attached the brand's traditional cues. "It's clearly a BMW, mission accomplished, on to the next project." An X5, with more dramatically flared fenders, has a brawnier appearance. The Q5, GLK, and XC60 all have more thoroughly styled, more distinctive designs. Similarly, the interior design could be more dramatic and inspired. In the tested car, an attempt by the oyster leather and wood-covered center console to lend the interior a warm ambiance was defeated by the all-black instrument panel. The Audi, Mercedes, and Volvo all have more stylish interiors. BMW's latest tweaks have reduced but not eliminated the crossover penalty. The 2013 X3 is certainly fun to drive. With more nuanced steering it would be an absolute blast. Thanks to the new turbo four, suburban mpg is nearly as good as in a similarly hefty AWD car. Highway mpg takes a bigger hit. Ride quality proves the most difficult challenge. To make a tall vehicle handle well, you need a stiff suspension. This isn't entirely a bad thing, as BMW hasn't been able to soften up the X3 as much as it has its sedans. Even ride quality is much better than in early X3s, though. Competitors are more stylish. But if I had to pick a compact crossover for a challenging road, it would be either a BMW X3 or the new Audi SQ5 (not yet driven). Space for a couple more cylinders, but few people will need them. Had to slide front seats forward temporarily to fold second row. Total of 63.3 cu. ft. about avg. BMW provided an insured car for a week with a tank of fuel. 2013 BMW X3 pros and cons, according to Michael Karesh: the best reasons for buying (or not buying) the 2013 BMW X3. Join TrueDelta to post your own impressions.